- I have also been told the ducting is wrong as some branches run straight off the end of the trunk (I forgot the term for the extra amount of run that allows pressure to build) so either way that can be fixed. - Speaking of the kitchen, it is probably the coldest area overall. Wondering if some more supplies would also help. You need -- among other things -- to get returns into the zone 1 section of the house. I presume there is a door between the music room and the kitchen? That's too bad... but at least returns in the music room will help. The basement on the other hand is somewhat limited. The only openings for ducts are pretty much where they are. The Mud Room is actually over a crawlspace and the Living Room is over a 2nd basement, both products of non-original additions - meaning the ductwork goes through what used to be a tramsom window to outside. There is probably some room in that opening to pass a round duct through for a return, though it would be a routing nightmare to tie it in the the return trunk once it entered the main basement, due to where everything is situated. I might be able to get it into the plenum itself. That said, the Mud Room is newer w/ R21 insulation, and except for the sliding door area stays pretty warm, unless it's very cold and there is some wind wash from the crawlspace (despite the R30 in the floor). Also worth noting that the house is built into the side of a hill and the basement and crawlspace are walk outs. That should help a lot -- you'd be surprised. Thanks again. Aside from the additional return, is there any advantage to moving to a single zone for the 1st floor? Either way I'd probably need a booster or two to move the air, unfortunately.... unless you think capping the end of those ducts (the "BAD" spots) will solve it. Clearly is it losing velocity once it gets to the other side of the house, but I'm not sure if that's due to pressure issues, leakage issues, too much flex, or just too far away (or all of the above). Noted, and it's part of the plan. Is there a rule of thumb for how much velocity loss vs distance in a well-tuned system? I have a cheapo anemometer and can take values at the closest and farthest duct to compare. Keep in mind if you want air out, you have to make sure you let it in. 13- 6" supplys @ 19sq in =247 sq in of openings. Both supply and return duct should equal 10"x25" to handle those equal openings. Your return openings need to equal 247 sq in. also. Don't shoot me but this is a rough rule of thumb. Assuming I leave the zones alone, I can probably convert the far left kitchen register to a return very easily ( I think code prevents anything much closer) but I supposed I'd need a register to replace it too. 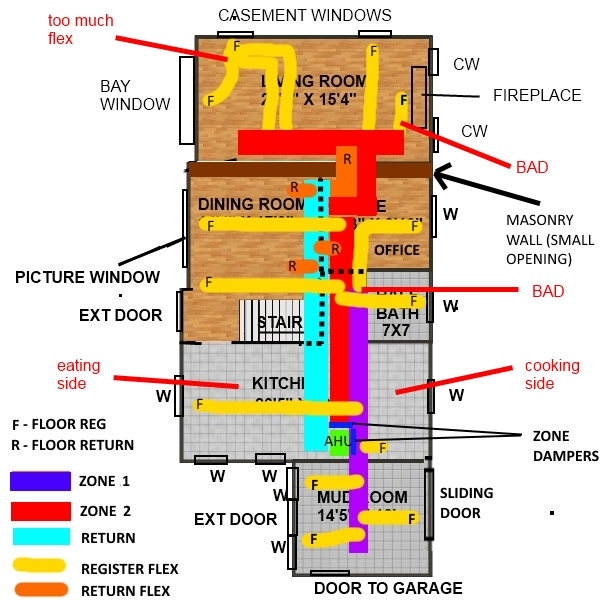 Maybe between the windows that don't have it now, or over the zone 1 duct (though it would be in a corner abutting an oven and a fridge) The living room is a lot tougher unless I run additional ductwork. The lone return in there is a 12" (maybe 14") flex through the wall opening to the other side. The mud room may be near impossible unless I convert the farthest one or change the ducts to all round and even then it would be a plumbing nightmare. Also have to consider getting too close to the stove as there is an old window opening connecting them (along w/ a doorway). Maybe I just need to just double the size of my existing returns lol.